Braydon Coburn was traveling along the usual development road map for young defensemen. Chosen by the Atlanta Thrashers with the eighth overall pick in the talent-rich 2003 NHL Entry Draft, Coburn was learning the pro game in measured stints with Atlanta and its AHL affiliate in Chicago. But that gradual development got thrown into overdrive when the Thrashers sent Coburn to Philadelphia last season for veteran blueliner Alexei Zhitnik. Coburn went from playing 12 minutes a night with the Thrashers to 20 minutes per game with the Flyers after deal on Feb. 24. "I was confident that I was going to get a chance in Atlanta," said Coburn. "Before I got traded, I played quite a few (NHL) games that year. I was confident my game was getting better all the time and that I was going to evolve into a good (defenseman), no matter what. I think coming to Philadelphia just sped that up. "I came here and I got to play right away and that really helped me out a lot. They threw me into the fire a little bit earlier, (but) that helped me a lot." In 29 games with the Thrashers last season, he had just four assists. 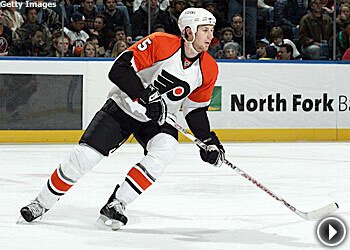 But in 20 games with the Flyers, he had three goals and seven points, and was given time on the power play. Coburn was penciled into the second defense pairing to start this season, and he's second among Flyers defensemen with seven goals, 22 assists and 29 points. At 6-foot-5 and 220 pounds, Coburn looks like the William Penn statue that stands atop Philadelphia's City Hall, but skates like a far smaller player. General Manager Paul Holmgren has referred to Coburn as a greyhound. A better comparison might be a stallion -- an untamed horse. "I think the thing with Cobie is, everyone is in agreement that he has to slow down a bit out there," said veteran Derian Hatcher, who has been paired with Coburn for most of this season. "That's what we're trying to work on. He's definitely getting better with that. But once he learns how to use his speed in the right places, there's no saying how good he can be." Having a veteran like Hatcher as a partner has been invaluable in Coburn's development, providing him a security blanket for the inevitable mistakes a 22-year-old defenseman will make. "Hatch has played in the League a long time. I've played with him and Gator (Jason Smith), both these guys are veteran guys that have been in the League and they know how to play the game, they're physical guys, they're always in position," Coburn said. "Positionally, they know what they're doing out there. For me, it's easy -- when I need to make a play I always know where they are and I try to work my game to learn from them, to learn about positioning and how they compete every night." It's been a steady process, one Flyers coach John Stevens – himself a former NHL defenseman – has enjoyed watching. "He's a bright, young prospect," Stevens said. "The first thing you notice is his skill set. He's big guy, skates extremely well, good passer, good puck skills. He's not a good skater; he's a great skater. A guy that big that skates that well, it's pretty impressive. We work on all parts of his game -- better decisions with the puck, better decisions defending, and the one thing is we don't want him just throwing the puck away. When his feet aren't moving, he neutralizes himself and we want him taking the puck up the ice and being active with the puck and using his skating as an asset. Most times it's been there, but we'd like to see it every night." Coburn believes what his coaches and the public have seen so far is just the tip of a very large iceberg. The better he feels about himself, the better his play will be. "I think it's confidence; confidence in myself," Coburn said. "I think I got that from being put in situations where I can play a lot. I feel like the coaches have a lot of confidence in me when they do put me in those spots. I feel my year's been better this year because of the confidence I've built up by knowing I can play in this League and in the confidence the coaches have shown in me."